With our network of towing companies, Southside Wrecker & Towing in Fort Smith, AR can offer you 24/7 wrecker and roadside assistance anytime, anywhere! Our other towing companies include Southside Wrecker Service in Hackett, AR and AA Wrecker Service in Barling, AR! We will send the closest available wrecker or you can call the nearest location listed below. We Do ANY Kind Of Towing! Our team of wreckers is always ready to assist you in your time of need! We work hard 24/7 to ensure that no matter where you are, we can get to you as quickly as possible. Not to mention, we can literally tow anything! From light, medium to semi towing, we truly do it all! 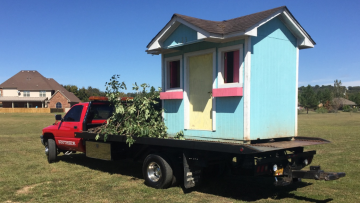 Even unconventional requests like towing a dollhouse, we can get the job done!